Derby has one of the country's most diverse selection of real ales served across a collection of differing pubs that Derby CAMRA believe many other areas are jealous of. Just considering the brew-pubs, Derby can boast a staggering number including the Brunswick Tavern, the Falstaff and Mr Grundys. Micro-pubs are featured with the Little Chester Ale House and the Last Post. The Seven Stars and Ye Olde Dolphin add a lovely historic interest to any drink around Derby. 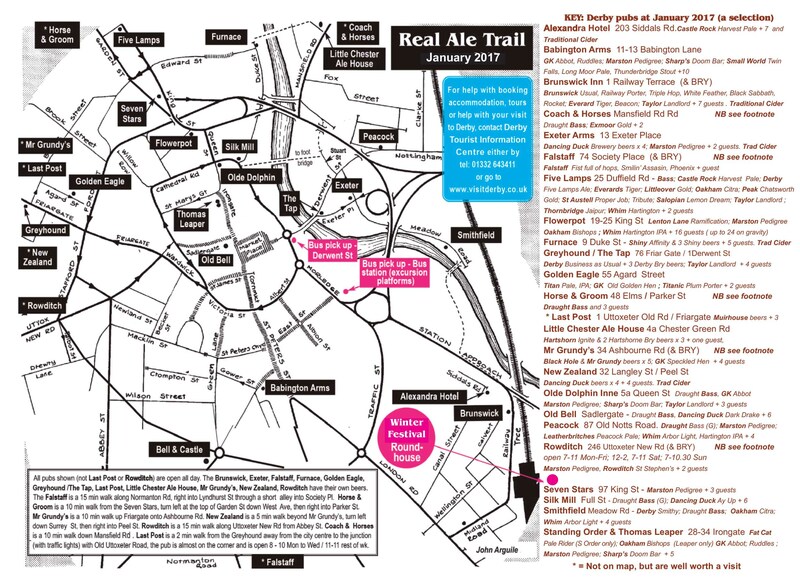 Or take a bus to some of the jewels in the rural parts of Derby CAMRA's area like the Royal Oak at Ockbrook. What ever your tasts or reasons for going to a pub, we think Derby and its surroundings has something to offer. This page hopes to help you find what you are looking for. Fancy a handy location map to the pubs worth visiting in Derby City? Click on the image above to download the map everyone needs for a cracking night out in Beer City - the Real Ale Capital of England! When visiting a pub please remember to score the beer on CAMRA's WhatPub site. The scores are used to help complile CAMRA's Good Beer Guide, so we think it is important! If you have any updates or comments regarding the information on WhatPub, you can either follow the link on WhatPub or email the Pubs Officer. The 2018 Derby CAMRA Pub of the Year Overall winner is the Smithfield. The views expressed on this site are not necessarily those of the Campaign for Real Ale Ltd. Whilst every effort is made to ensure that the information on this site is accurate and up to date, no responsibility for errors and omissions can be accepted. Links to external servers do not imply any official CAMRA endorsement of the opinions or ideas expressed therein, or guarantee the validity of the information provided. Links to commercial sites are in no way an endorsement of any vendor's products or services.